In the old days, an air filter was an air filter. You had one because you needed to protect the innards of your AC and furnace from dust and dirt. That was it. Nowadays, we know a lot more about indoor air quality. We’ve learned that allergens and volatile organic compounds (VOCs) tend to accumulate inside indoor air. These things are contaminants. We need a way to remove them from our homes. Thankfully, air filters aren’t just good for keeping our HVAC system clean – although they do perform that function. They can help keep indoor air clean, too. A typical 1” air filter will do an ok job keeping dust and particulates out of your HVAC equipment. They’re also cheap and readily available. 1” filters are available in a variety of MERV ratings. MERV, of course, is a measurement of a filter’s ability to filter out contaminants. It stands for Minimum Efficiency Reporting Value. The higher the MERV, the smaller the contaminants it can remove from the air. Unfortunately, pleated 1” filters with MERV values above 12 can increase the static pressure in your HVAC system. Raise the static pressure enough, and you’ll inhibit airflow. This often leads to serious discomfort, not to mention equipment problems. To avoid raising static pressure, you might be tempted to use a low-MERV, non-pleated 1” filter. That filter might keep your HVAC system clean, but it won’t keep your indoor air very clean! It’s just really hard to balance adequate air cleaning (MERV values) with minimizing airflow restrictions. Unfortunately, there’s a lot of bad design around 1” filter assemblies. If your filter rack doesn’t hold the filter just right, air will go around the filter. In other words, a lot of your air will be unfiltered. MERV 0. We see it all the time. In most cases, you’ll have to change or wash the 1” filter very frequently – every 60 to 90 days depending on how much you run your AC and heat. 1” filters capture particles in the air, but they almost never do anything to control odors. If you want your air filter to remove VOC odors and make your house smell better, you’ll need something else. Media filters offer the filtration performance you want without the downsides. Basically, you get high-MERV filtration with zero negative consequences for static pressure and airflow. If that sounds like what you’re looking for, the media filter is your answer. Oh, and you only have to change it once or twice per year. More surface area: High-MERV 1” filters simply don’t have enough surface area to provide good filtration performance and airflow performance at the same time. The F100 is more than 1” thick. It’s got enough surface area to prevent significant static pressure increases while also filtering bacteria and allergens as small as 0.3 microns. Easy maintenance: Just open a door on the side of the filter box, pull out the old filter, put in the new one. Done. And you only have to do it once per year – twice if you run your HVAC system a lot. Upgrade options: The F100 filter has a MERV value of 11. If you want a higher MERV value, you can upgrade to the F200 (MERV 13) or F300 (MERV 14) and use the same filter housing. Better filter housing: Unlike the bad design of many 1” filter setups, the Honeywell system seals the filter in. All of the air gets filtered – it’s virtually impossible for air to go around the filter itself. Carbon filter coatings make your house smell better. Any time odor control is a priority, we recommend a media filter with carbon coated fibers. Currently, the best, most readily available carbon coated filter is the Carbon Clean 16. This media filter is coated with activated carbon (the fibers are black, not white). Activated carbon contains microfissures that increase the carbon’s surface area and encourage odor absorption. When air passes over the coated fibers, the filter removes the odors from your indoor air. The Carbon Clean 16 also has a MERV value of 16. It can capture the viruses, bacteria, and mold that might be making you feel sick. 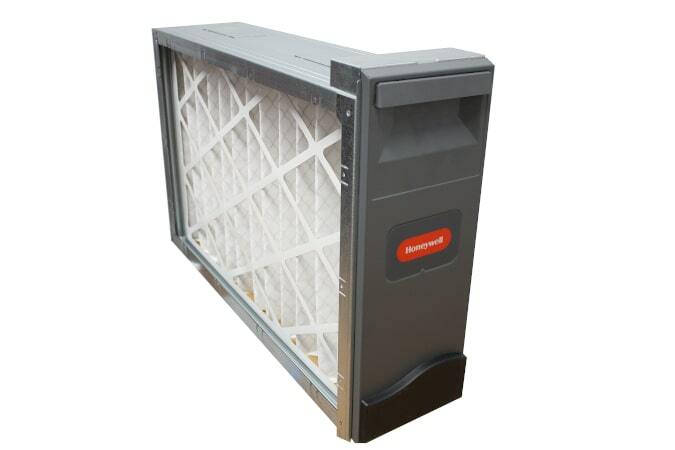 The only type of filter that’s “above” the Carbon Clean 16 in terms of filtration performance is a HEPA system. Strongly consider a media filter instead of just buying a high-MERV 1” filter. The 1” options simply can’t filter air effectively while also ensuring optimal airflow and HVAC performance. Media filters can, and that’s why people love them.